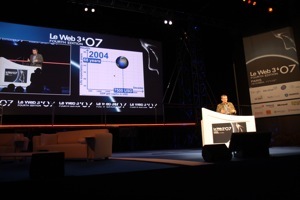 The LeWeb3 was one of the most professionally produced conferences I have attended in several ways. The video projection was the best I have ever seen and the audio quality was top notch with very engaging musical intros. I also liked the schedule with lots of time for networking in the coffe and lunch breaks. The lunch offering was a totally staggering buffet of french gourmet cuisine at it best. A two hour lunch break with hundreds of small dishes makes it easy to relax and network! his presentations at TED have made him world famous, don’t miss them! This was a somewhat confused panel discussion, as it consisted of very different types of peope that did not know anything about each other. A trio of entrereneurs presented their models, it showed just how difficult it is to come up with ways to earn real revenue. Another entrepreneur reported having bought a Facebook ad campaign with 1 million impressions that generated just 3 (three) clicks. My conclusion: Nobody knows what will be the keys to monetization, but ads as the only revenue model is not working now and probably not in the future either, as the competition for ad dollars increase tremendously. “I believe in revenue and profit” (applause from the audience). ” I don’t worry about Google’s policy of letting their employees use 20% of their time for their own projects. I worry about the other 80%! Why do they still have the punch-clock thinking? Martin Varsavsky came on stage with the message that there are indeed investement opportunities also in Europe, and that our 22 languages can be turned into something good. He also mentioned that 17% of Googles total revenue comes from the UK market alone! His blog is a must fo everyone interested in internet-related entreprenership and international business. Asterpix, a new, highly interesting video site reviving the old concept of “Hypervideo”, (interactive video). There are clickable areas in the video that lead to notes and links. You can also see annotations in a list and use them to navigate inside a video clip. Very smart! Also interesting is the fact that they have invented nothing new, they “just” saw that nobody was using the existing technologies to make really simple solutions and then market them. When Skype was launched, it had been possible for years to talk via MSN chat, but Microsoft had not realized that this possibility could be used to replace telephony. But Joost is a more complex service, since it depends on offering good content and therefore deals with hundreds of programme rights holders around the world. But the biggest obstacle to overcome before Joost is a Skype-like success will probably be to make people more active in their viewing habits. Coach-potatoes are more common today than the stats show, even among the young! 2. Integrate Joost into the digital cable TV offering from the triple-play operators. 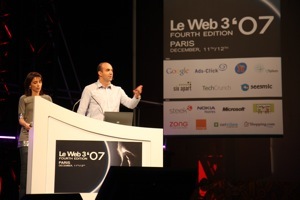 The only mishap at LeWeb3 was the strange ending. The last two sesssions was somewhat disconnected from the conference topic and the speakers suddenly found themselves alone on the stage. One of the speakers that I wanted to hear, (David Weinberger) was inexplicably dropped from appearing on stage. 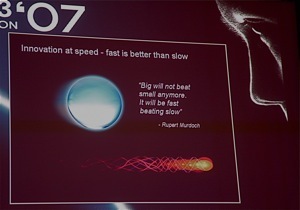 All this caused the energy in the room to drop at the end and people left the conference with a feeling of anti-climax. A grande finale session with uplifting foresights into the future was sorely missed!